This blog is republished here as part of our special holiday selection. 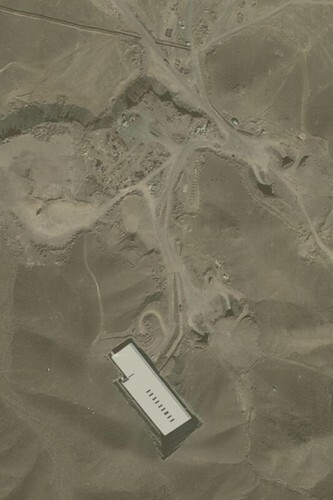 Satellite imagery of suspected Fordo underground uranium enrichment facility in Iran. Photo: Podknox/flickr. NEW YORK – Most of the debate about how to address Iran’s efforts to develop nuclear-weapons capacity focuses on two options. The first is to rely on deterrence and live with an Iran that has a small nuclear arsenal or the ability to assemble one with little advance notice. The second is to launch a preventive military strike aimed at destroying critical parts of the Iranian program and setting back its progress by an estimated two or more years. But now a third option has emerged: negotiating a ceiling on the nuclear program that would not be too low for Iran’s government and not too high for the United States, Israel, and the rest of the world. In fact, such an option has been around for years – and in several rounds of negotiations. What has changed, however, is the context. And changes in context can be critical; indeed, what happens away from the negotiating table almost always determines the outcome of face-to-face talks. The single most important change in context is the rapidly deteriorating state of Iran’s economy. The many financial and oil-related sanctions that have been implemented in recent months and years are starting to bite. They were designed not to impede Iran’s nuclear program directly, but rather to increase the price that Iran’s leaders must pay for pursuing their nuclear ambitions. The thinking (or, more accurately, the hope) was that Iran’s leadership, if forced to choose between regime survival and nuclear weapons, would choose the former. This hypothesis may soon get a real-world test. Iran’s currency, the rial, has fallen roughly 40% in recent weeks, sharply increasing Iran’s inflation rate and what Iranians must pay for imports and many staples. The result is the first signs of serious public discontent with the regime since the violent repression of the Green Movement in 2009. Iran’s merchant class, one of the pillars of the clerical establishment that has ruled the country since the 1979 revolution, is grumbling as well. Other factors also could give negotiations a real chance. Upheavals in the Arab world suggest that no regime in the Middle East is entrenched; Iran’s leaders would have to be blind not to have taken note. In his speech at the United Nations in late September, Israeli Prime Minister Binyamin Netanyahu signaled a willingness to give sanctions more time, until at least the summer of 2013. And there are signs that, regardless of who wins November’s presidential election, the US might well undertake an armed strike, with potential destruction much greater than if Israel were to act alone. Again, the Iranians might see compromise as the lesser of the threats that it faces. Until now, negotiations have been desultory at best. The compromise that Iranian officials are suggesting is nowhere near what they would have to accept to avert military action and gain an easing of sanctions. But now is the time to present to Iran a comprehensive package – what it must do and what the reward would be if it agreed. It would also be essential to set a deadline for Iran to accept such an accord, lest it use further negotiations to buy time to improve its nuclear capabilities. The precise terms would have to be determined, but Iran would have to give up all of the uranium that it has enriched to 20% and stop enriching to that level. It would also have to accept a ceiling on how much uranium it could possess or enrich at lower levels. Limits on the number of centrifuges and where they could be housed might also be necessary. Inspections would need to be frequent and intrusive to reassure the outside world of what Iran is doing – or, perhaps more to the point, what it is not doing. In return, Iran would receive substantial relief from the removal of those sanctions imposed in response to its nuclear program. Moreover, the offer’s essential elements should be made public. That way, if the regime balked, it would have to explain to its own people why it was not prepared to abandon its nuclear-weapons program, despite a reasonable US proposal that was not designed to humiliate Iran, and that, if accepted, promised a major improvement in Iranian living standards. It is possible that the new economic and political context will lead Iran’s rulers to accept what they have rebuffed until now. If, on the other hand, the regime remains determined to pursue its nuclear goals, regardless of cost, then we will know that there is no alternative to the first two options: attacking Iranian facilities or living with a nuclear-armed Iran. Both outcomes are potentially risky and costly, but the US public, in particular, should be made aware that it was Iran that rejected a reasonable alternative to war before one began. And, if push came to shove, it would be good for other governments to know that the US and/or Israel decided to attack only after offering Iran a face-saving way out. That would make it less difficult to keep economic pressure on Iran in the aftermath of any strike. Going public makes sense for another reason: Iran’s people ought to know that any attack on the country was one that it had largely brought on itself. This realization might mute any “rally around the flag” reaction and thus not rule out regime change down the road. We tend to think of diplomacy as something carried out in secret; sometimes, however, it is better to hide in plain sight. This is such a moment. But time is of the essence; diplomacy needs to move faster if it is not to be overtaken by Iran’s march to a nuclear weapon – and, with it, the march to conflict. Richard N. Haass is President of the Council on Foreign Relations. His next book, Foreign Policy Begins at Home: The Case for Putting America’s House in Order, is to be published in the spring. I am not sure it is established that Iran indeed is pursuing nuclear weapons as suggested in the first paragraph? Furthermore, it appears to me the author is serving the reader a substantial dose of ethnocentrism by claiming the entire world (minus Iran) is profiting from the Israeli/ U.S.’s worldview. It indeed misses a whole lot of varied positions in the world. Finally, by lauding the economic sanctions burdened on the shoulders of the ordinary Iranian citizen, Mr. Haas is ignoring a recent issue of the medium is foremostly publishing in, the Council of Foreign Relations (Cfr), in which fellow authors eloquently argue that foreign sanctions have historically never worked – not even in the former Yugoslavia. I deem we won’t make substantial progress in the matter of a nuclear Iran – considering any other nuclear weapon in the world is undesirable wherever it may be – if we do not relate with possible Iranian motives, the Iranian culture and abandon these politically and ideologically charged propaganda. Thank you.